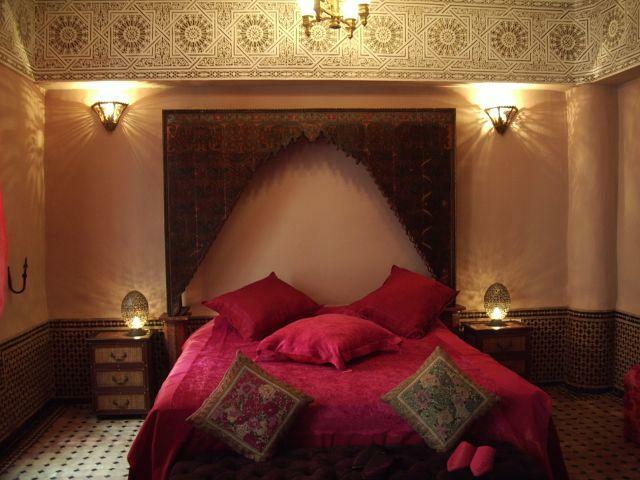 Riad Ibn Battouta - Luxury Riad in Marrakech, Morocco. 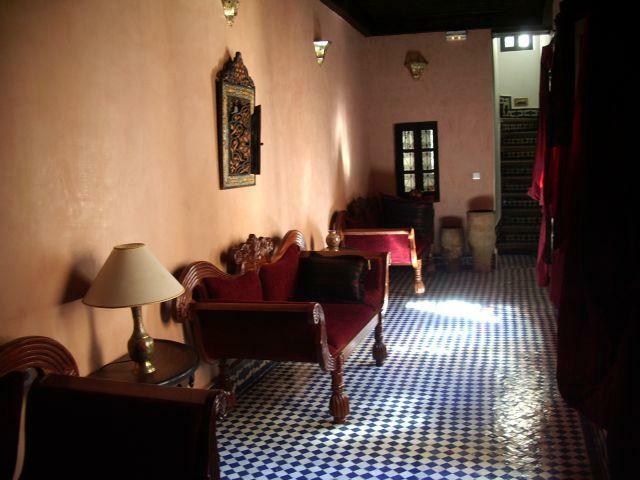 Book Riad Ibn Battouta Today with Hip Marrakech - specialists in English Speaking Accommodation in Marrakesh, Morocco. 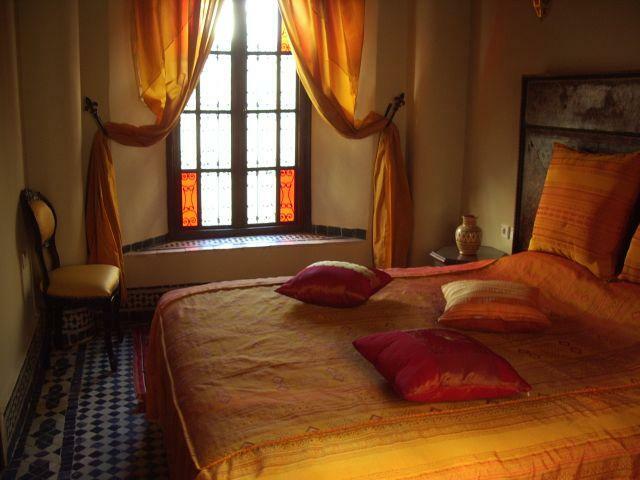 "Each room conjures up a unique ambience that blends East and West." 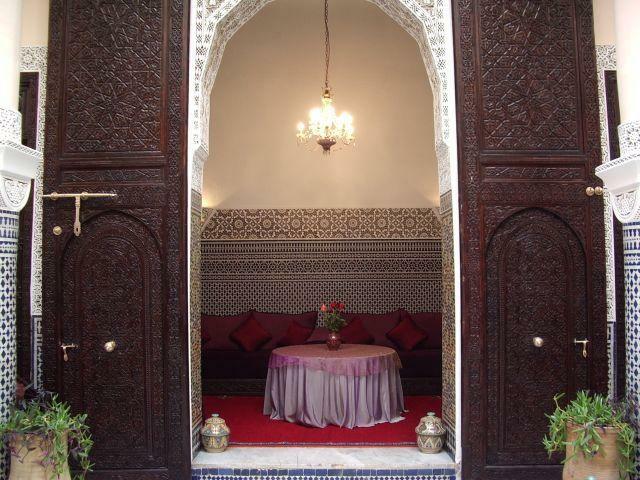 This is an excellent location for exploring the labyrinth of the oldest medina in Morocco, as well as being close to taxis for a trip to the new city. 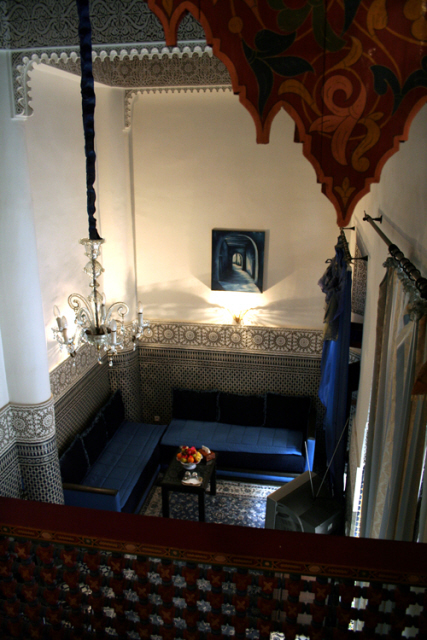 Each of the seven suites (two of which have their own private roof terraces) is decorated in the style of one of the destinations of that famous traveller of old, Ibn Battouta. 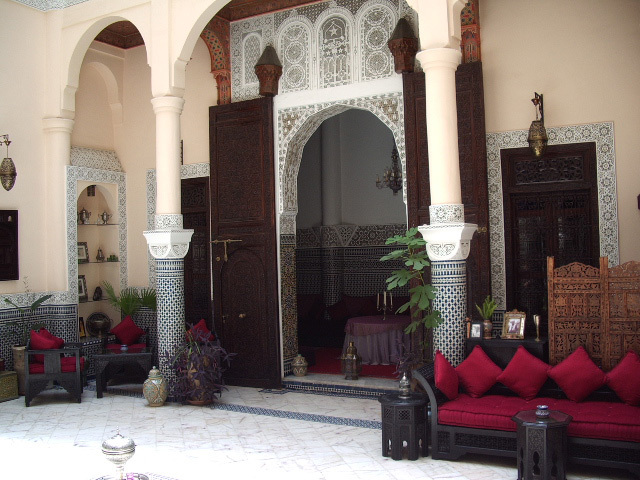 Each room conjures up a unique ambience that blends East and West. 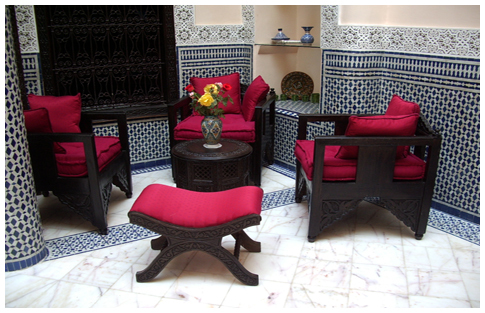 Relax in the traditional hammam, the massage room, or on the roof terraces where breakfast and dinner can be served, or simply settle into a comfortable chair and listen to the soothing sounds of the courtyard fountain. 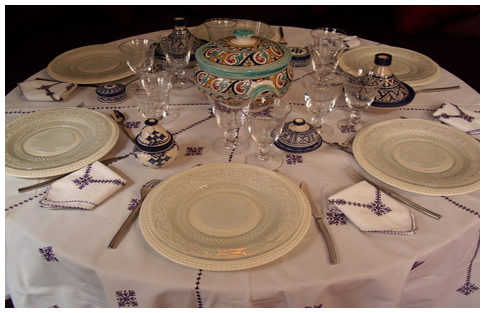 Our restaurant offers all the refinements of traditional Fassi cuisine. 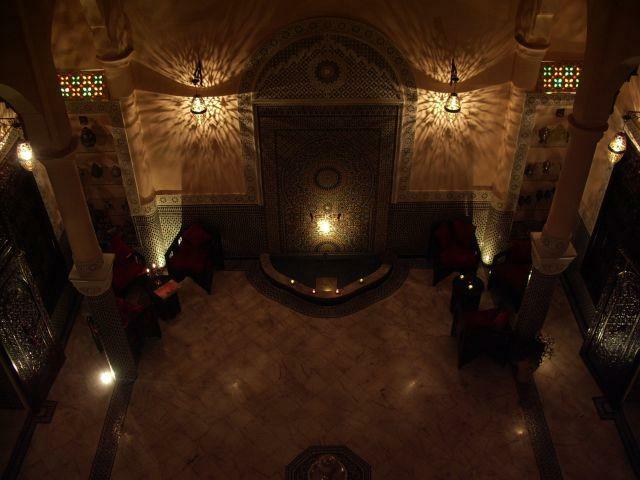 Dinner can be served in our courtyard in the glow of the glass lamp suspended high above the rich marble and mosaic tiles. Separate lounge area. En Suite bathroom with blue and white mosaics and stone-coloured tadelakt wall finish, glass washbasin. Complete with reversible air-conditioning, personal safe, mini-bar, satellite television, telephone and hairdryer. Decorated in yellow with one double bed and two single beds if required. Separate lounge area. 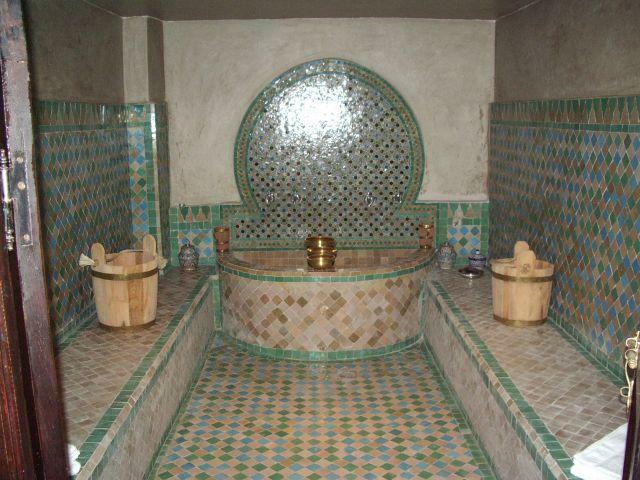 Bathroom of traditional zellige (mosaic tiles) and mosaic bath; yellow tadelakt wall finish and glass washbasin. Separate lounge area. En Suite bathroom with taupe tadelakt wall finish, large shower. 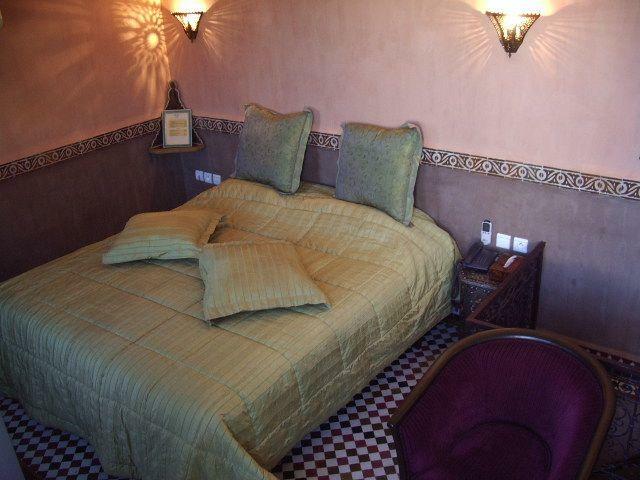 African-theme suite with one double bed and one single bed. 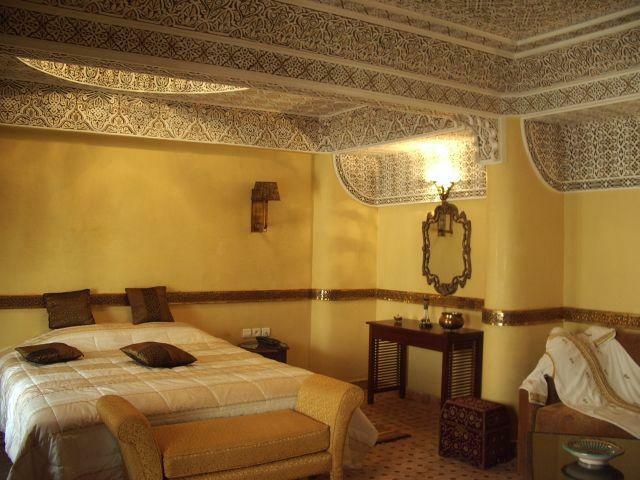 A separate lounge area with balcony, and ensuite bathroom with sand-coloured tadelakt wall finish. 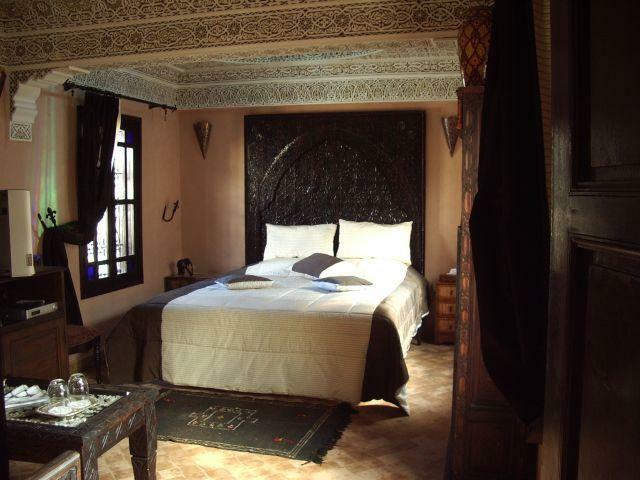 Bronze-themed suite with one double bed and two single beds, if required. Separate lounge area. En Suite bathroom with coppery pink tadelakt wall finish and bath. Green room with one double bed. Lounge area. Bathroom with zellige (mosaic tiles) and tadelakt wall finish in brown and tobacco. 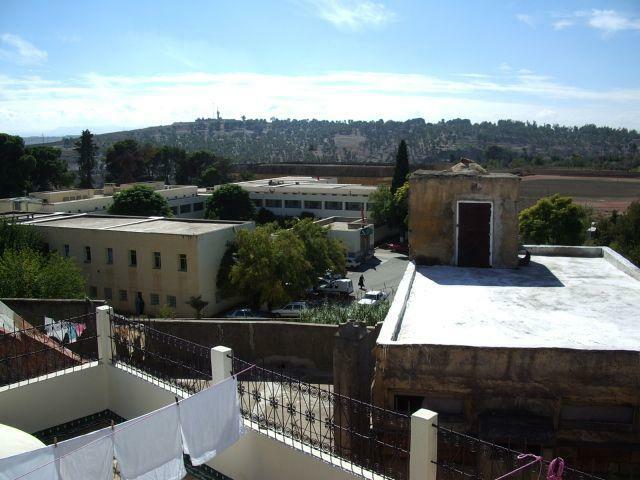 Private roof terrace. Light-filled room in grey and white with one double bed. Corner lounge area. Bathroom in black and white zellige (mosaic tiles), with glass washbasin. Private roof terrace. Light-filled room in tones of beige with one double bed. Ensuite shower room in glass. 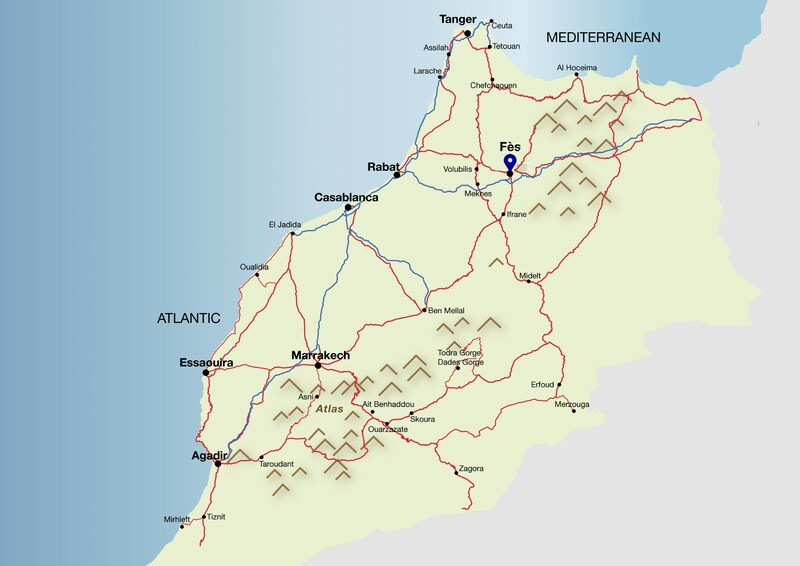 The base rate price at Riad Ibn Battouta is in pounds, euros, or Moroccan dirhams and exchange rates are approximate. Best Price Guaranteed! 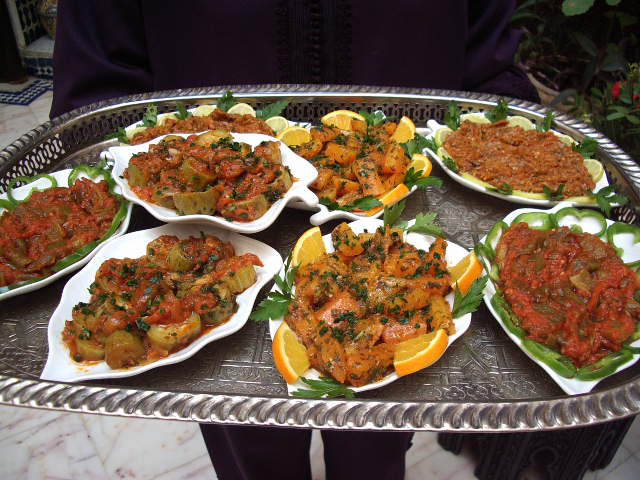 All prices match or are lower than those charged directly by Riad Ibn Battouta. 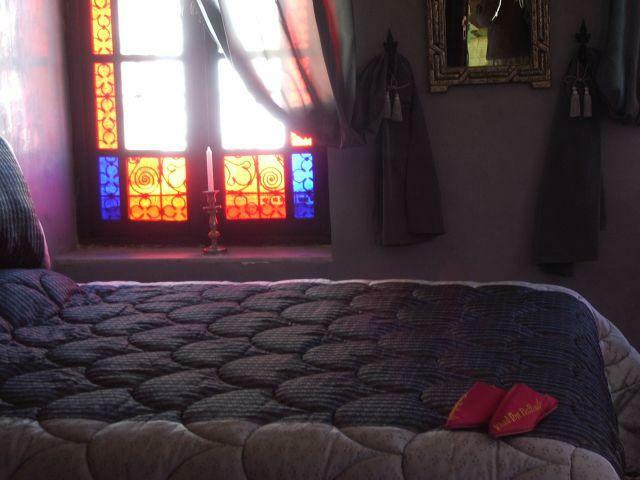 We can check availability at Riad Ibn Battouta for you, process your booking and assist you in finding alternative dates and accommodation if your first choice is already taken. 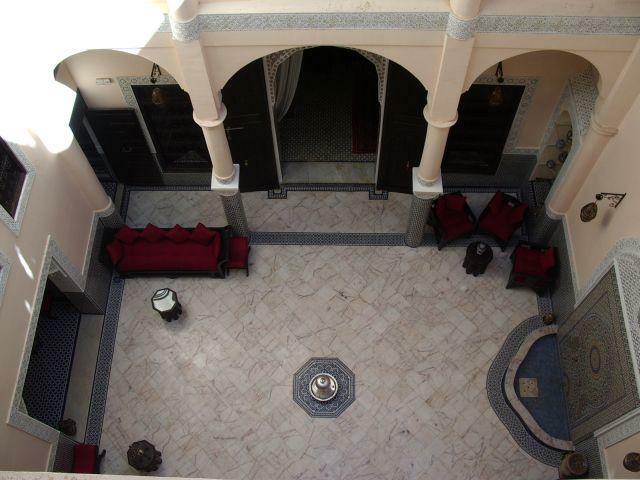 Every member of our team has expert knowledge of each riad including Riad Ibn Battouta and can provide more information about the rooms, the location and how well suited it is to your specific requirements.